Witnessing the grand stature of the mountains has left me with a skewed sense of perspective. From their summits, you can see the world from above, everything beneath the sky from a single point so high above the rolling hills below. But what cannot be seen is the world beneath. For the better part of the last four years living in the north east, I never knew that there existed something so spectacularly different. A vast network of caves laces the same footprint as the mountainous peaks, as though beckoning where those towering heights once began. Soon after learning about the caverns beneath the mountains, the allure had me fixed. None the less, how close they have been hiding all these years (much closer than the High Peaks). 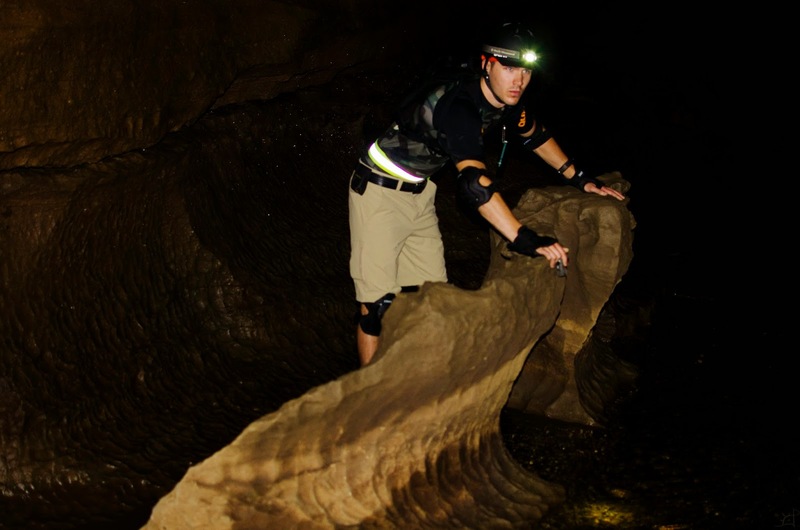 Taking an afternoon, two friends and I set out to explore one of the better known and more accessible, Clarksville Cave. 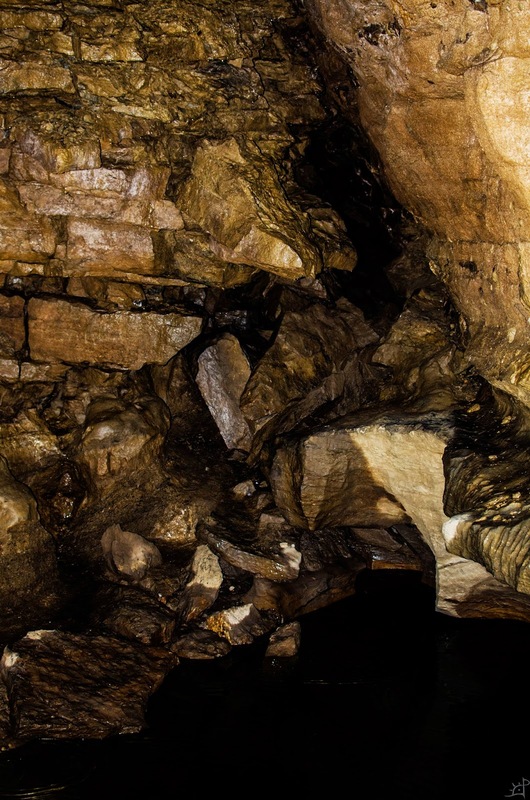 Nested between the Catskill Mountains to the south and Adirondack Wilderness to the north, the cave system is just short of a mile long between all of its passages, making it one of the longer horizontal caves in the north east. Upon a small, well worn trail through the woods we began the journey until we came across what might have been a sinkhole in the ground. Very little marked this site save a pair of craggy holes that emptied into darkness. The first, in the upper left corner of the picture, was too narrow and collapsed to fit through, leaving the one between the three us. 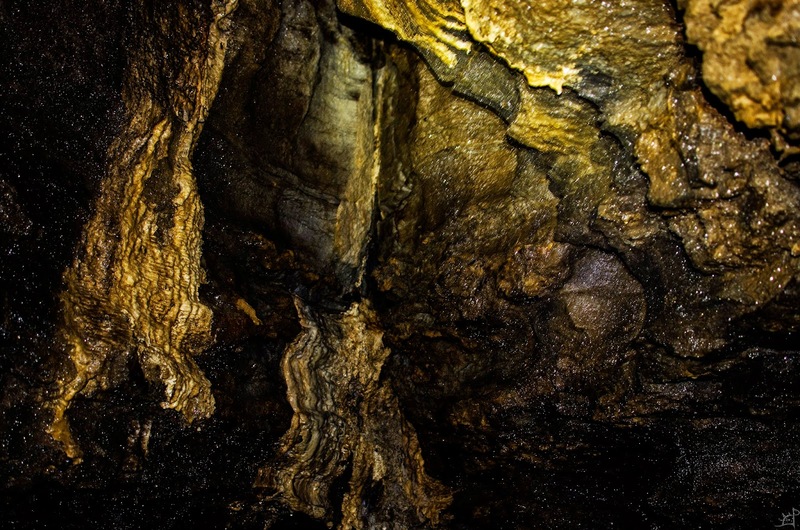 Forced to depack and slide down feet first, the entryway to the cave was tight and winding and met with a blast of air easily half the temperature of the world above. Not long after navigating the narrow passage, the cavern gave way to a long, narrow chamber that was tall enough to stand in. 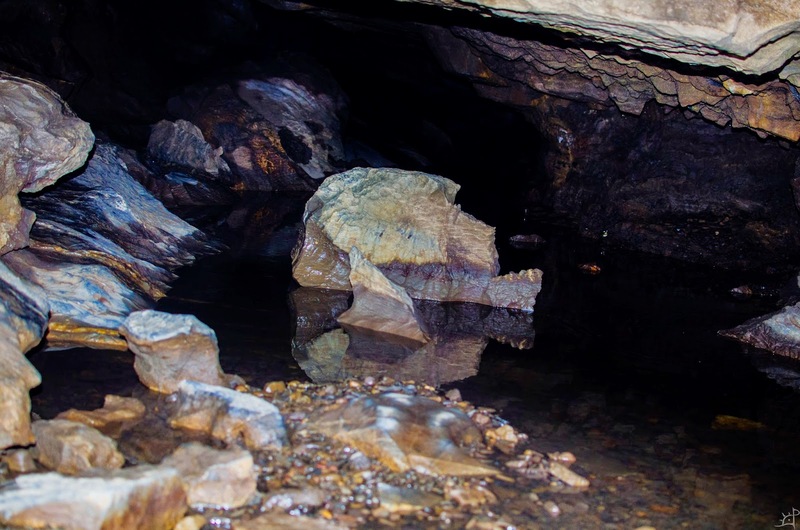 A small stream began to appear between the loose rocks of the cave floor. Colder than the air, it was enough to make our feet numb within minutes. Yet that did not dissuade us; taken by the brilliant and alien landscapes carved by centuries of water, our minds were elsewhere. 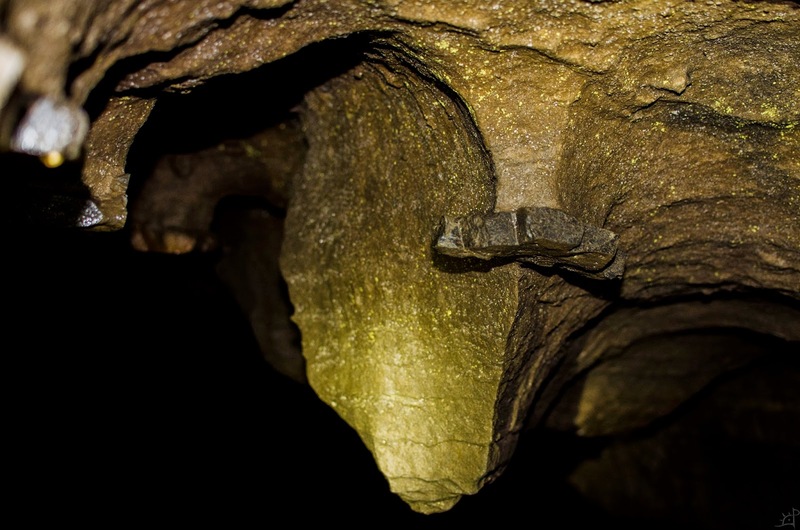 On the ceiling clung countless formations of strange shape and size, all covered in a gold and silver lichen that glittered like veins of precious metal. Each movement of our lights caused the myriad stars to shimmer and glisten, dancing in the reprieve from utter darkness. In places, the minerals born in the water collected on the walls and painted great rolling deposits as hard as bone. Bubbles and streams frozen in time hung on the stone, growing slowly and covering rings of crystal trapped inside. These were, as best I could tell, the genesis of geodes seen half way through their birth. Islands of rock jutted from the streams like seen out in the deserts and canyons of the west. Strange tunnels and holes pitted the surfaces, sometimes cutting through clean to the other side where the river decided its path must lead. 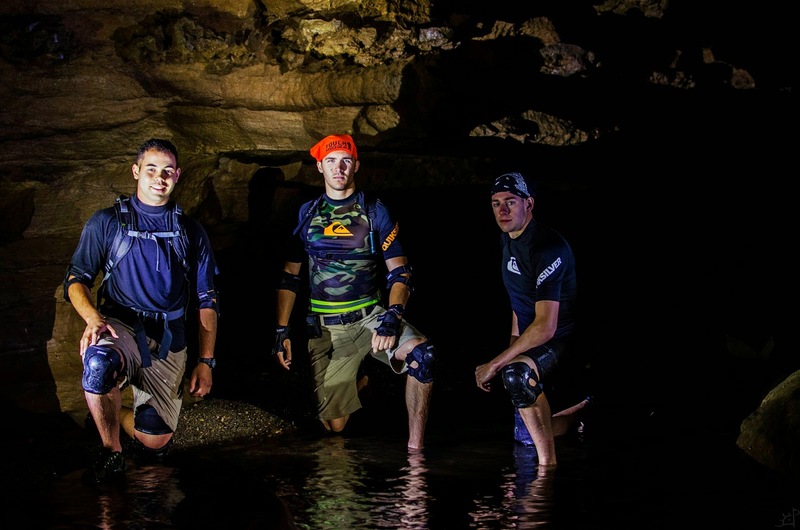 At the end of the first passage, after over an hour's wade and crawl through the underbelly of the mountains, we came to a dark lake whose mysterious depths could not be seen. Here, half a dozen channels led out in spidering directions only to end abruptly against the smooth walls. Three times our own height or more, the ceiling suspended itself in this surreal world, silent and waiting for the earth to change around it. Knobby pears hung out over the river where hundred of years ago the waters roamed farther and deeper and, upon their sinking back into the earth, left behind a gentle slope away. So narrow were the passages in places that we were forced to crawl through the waist deep water with our heads just above the surface, pressed down by the rocks overhead. 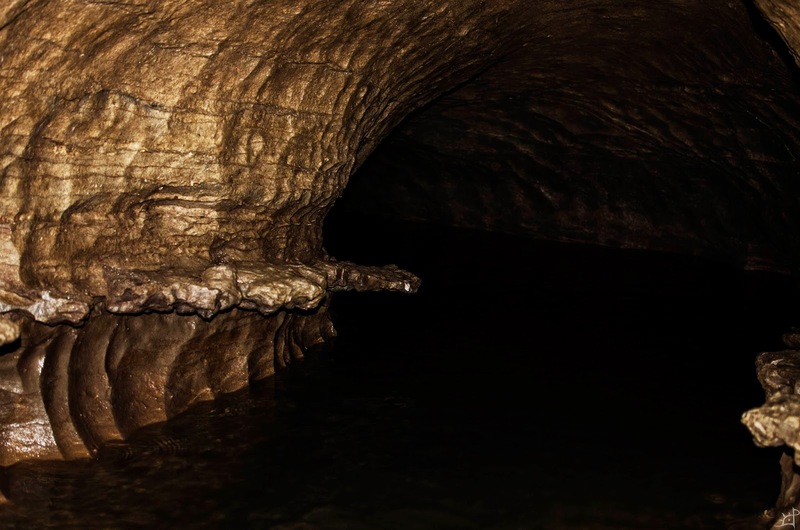 At times, the end was out of sight and the water grew deeper, while in others there was no air at all and the tunnels demanded a swim to the other side. 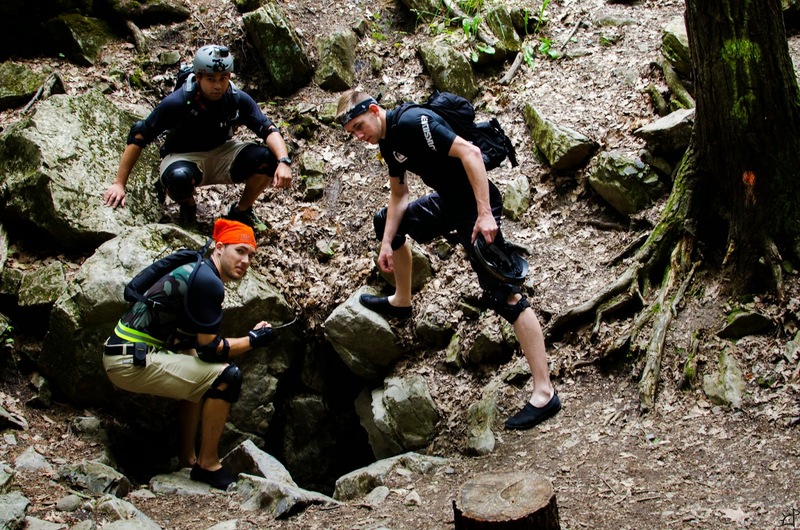 Setting up a quick camp, we embraced the beauty of the cave and marvelled in its secrecy. So many voids and glittering walls, the pure crystal water and stalactites only just beginning to crawl down towards the cave's floor, chutes and tunnels carved by the gentle water, blooming calcium pools and waterfalls hidden far in the depths of the darkness; it was truly a glimpse into an underworld. When we doubled back, we saw the first sign of life since entering the abyss. 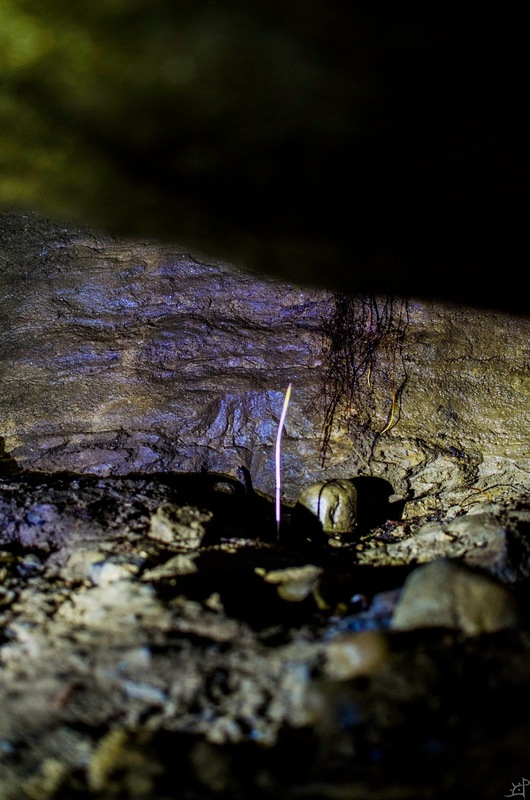 A single, lonely sprout growing in the rocky loam only a metre below the surface. It was a beacon, after a fashion, for it led us into another section of the caves that branched out again as far as we had already come. To me, these were the most spectacular of the vast underground rooms (in which I left my camera behind). Open spaces where rock slides had fallen long ago, parallel tunnels connected by a honeycomb of narrow passages, waterfalls and picturesque pools braced by thin shells of mineral deposits, and steep shafts leading to the shores of darkened lakes. Upon returning to the surface, the experience was surreal. It left us all in a trance and the drive to find others like Clarksville, and to explore the hidden world that so many will never see.